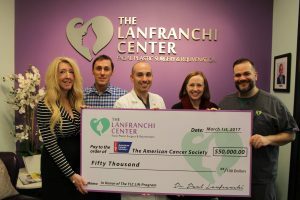 The Lanfranchi Center donates $50,000 to launch the “TLC Lift For Life” program that will provide taxi transportation for cancer patients in need of transportation services. LAS VEGAS, NV. (MARCH 02, 2017) – – Dr. Paul Lanfranchi and his private practice, The Lanfranchi Center Facial Plastic Surgery & Rejuvenation, has generously committed to helping more cancer patients get to their life-saving treatments. This program is known as “TLC Lift For Life” and is a proud supporter of the American Cancer Society and complements their Road To Recovery• transportation program. When Road To Recovery volunteers are unable to fulfill a ride request, TLC Lift For Life provides free taxi transportation for patients to and from their cancer care appointments. TLC Lift For Life will provide service for 35% of the currently unmet patient rides requested in Las Vegas. To request transportation, call 1-888-227-6333. The Lanfranchi Center has also supported The American Cancer Society by accepting new wigs, scarves, and hats on behalf of the Society’s Cancer Resource Center. They also participate in the Look Good Feel Better• program where volunteer beauty professionals share beauty tips with female cancer patients who are currently going through chemotherapy and radiation treatments. In efforts to uplift these women, this hands-on, two-hour workshop provides workshop services surrounding makeup, skin care, nail care and ways to deal with hair loss such as with wigs, hats, and scarves. Dr. Lanfranchi is both formally trained and Board Certified in Facial Plastic Surgery. The Lanfranchi Center is the only local Center of its kind, exclusively dedicated to rejuvenating the face and neck under local anesthesia. The Lanfranchi Center is open Monday – Friday 9 a.m. – 5 p.m. and conveniently located in Las Vegas at 8985 S Eastern Ave, Suite #120, Las Vegas, NV 89123 (215/Eastern). For more information, please call 702-929-3880. Follow us on Twitter @DrLanfranchiTLC, on Facebook at TheLanfranchiCenter, and on the web at www.thelanfranchicenter.com. The American Cancer Society Road To Recovery program provides free rides to cancer patients to and from treatments and cancer-related appointments. Trained volunteer drivers donate their time and the use of their personal vehicles to help patients get to their appointments to receive the life-saving treatments they need. To request transportation or become a volunteer driver, call 1-888-227-6333. The American Cancer Society is a global grassroots force of 2 million volunteers saving lives in every community. As the largest voluntary health organization, the Society’s efforts have contributed to a 25 percent decline in the cancer death rate in the U.S. since 1991, driven by less smoking, better treatments, and earlier detection. We’re finding cures as the nation’s largest private, not-for-profit investor in cancer research, ensuring people facing cancer have the help they need and continuing the fight for access to quality health care, lifesaving screenings and more. For more information, to get help, or to join the fight, call us anytime, day or night, at 1-800-277-2345 or visit cancer.org.